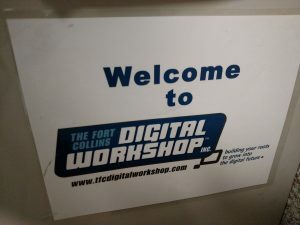 This month (June 2017) marks the 11th year of business for Digital Workshop Center. 11 years!?! Hard to wrap my ahead around it, but also honored and humbled by the growth of this business and trajectory we are on for the future. The original sign posted on the door of DWC in 2006! 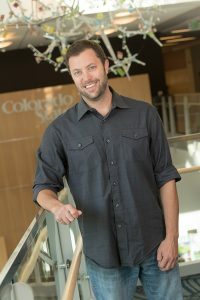 Since I started this business out of my house, I wanted to build a community center for education and professional development that I thought was missing in Northern Colorado. 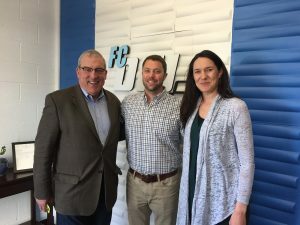 With minimal outside funding and a small savings to invest, the company has continued with organic growth, limited debt, and amazing partnerships with local government and businesses. We have found success with our focus on “skills, not degrees”. Furthermore, coworking and community events have now become a sustainable part of the DWC model as well. I am beyond proud of DWC. In fact, there are not enough ways for me to express how thankful I am for the opportunity to build DWC from the ground up and have you all come along for the ride. In 2016, we were able to help 83% of our unemployed students get back to work with full-time jobs. While being a small business owner comes with tremendous sacrifice, the reward for me personally is knowing that we are making an impact on people’s lives by helping those in need get the tech skills to get back work. DWC is making its mark and hopefully leaving this community in a better place than before we got here. In addition, we have worked with countless businesses in Northern Colorado to help train and retain the local workforce as best as possible. We want to continue to find ways to keep the talent that is “home grown” in this area (through the local schools and workforce) to have opportunities to stay and work here too. Some serious thanks are in order. If you have ever taken a class, taught a class, attended a community event, or been a part of anything DWC has done….THANK YOU! Truly, we are built on the base of our people and we have some amazing people here that hold this business upright. Our instructors are some of the best experts in their field and we are so lucky to have them here to help us bring the latest tech skills to the community. Furthermore, our administrative staff over the years has been absolutely phenomenal. I would be nowhere without them. (L to R) Fort Collins Mayor Wade Troxell, Stu, and Liz at DWC in Old Town Fort Collins! A HUGE thanks to Liz White and all she has done for the past 3 years to keep everyone (mostly me) in line. The next time you are in the office or on the phone, please tell Liz “thank you” and make sure to giver her the credit she deserves for being such a valuable and important part of all things DWC. I am so grateful to everyone who has supported me over the years and as we enter this 11th year of business, I am in awe of where have come from and where we are today. We will be having a community pot luck lunch on 06/22 at 12pm if you would like to come and celebrate our 11 year anniversary with us in person. Very informal and the FB event can be found here. With love and gratitude, cheers to 11 more years of Digital Workshop Center!